I confess I have not been the best blog keeper. I confess in my mind I have a daily writing practice, but, in reality, it is more like a weekly writing practice. I confess I do not like asking for help, for money, for favors (of any kind :). To that end, please join me this month as I begin a daily writing practice and ask for money and favors! Say what, Jilly? Let me explain. This month I am running (Oh, yes, I also confess I dream of running) what is basically a poetry marathon. I will be writing 30 poems in 30 days. Hey, wait a minute, those of you who know me might say, You’ve written a poem a day for a month before. What’s the big deal? Welcome to the 30/30 Project, an extraordinary challenge and fundraiser for Tupelo Press, a nonprofit 501(c)(3) literary press. One poet per month will run the equivalent of a “poetry marathon,” writing 30 poems in 30 days, while the rest of us “sponsor” and encourage her or him every step of the way. For December 2012, our first volunteer was Rebecca Kaiser Gibson. You can read her full month of poems here. For January 2013, we had 9 volunteers: T.M. De Vos, Shannon Hardwick, Lindsay Penelope Illich, Mike McGeehon, Janie Miller, Nina Pick, Katerina Stoykova-Klemer, Allyson Whipple, and Margaret Young. You can read their month of poems here. For February 2013, we also had 9 volunteers: Alison Cimino, Kate DeBolt, Lené Gary, T.J. Jarrett, Jacey Blue Renner, William David Ross, Joanna Solfrian, Dan Thomas-Glass, and Nina Israel Zucker. You can read their month of poemshere. This month, we again have 9 volunteers: Serena Chopra, Jill Crammond, Rachel Fogarty-Oleson, Brett Elizabeth Jenkins, Kali Lamparelli, George McKim, Luisa Muradyan, Dan Nowak, and Emily Rudofsky. Read their full bios by clicking here. Please follow their work (by clicking “Follow” on the bottom of the page), and feel free to acknowledge their generosity and creativity with a show of your admiration and support by donating on their behalf to Tupelo Press. (Click here to donate, scroll down to the form at the bottom, and put a contributor’s name in the “honor” field.) 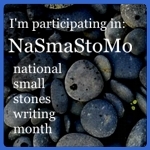 Just imagine what a challenge it is to write 30 new poems in 30 days! So you see, dear friends, this is a big deal. I will be writing for a cause. Writing to help a small, indie press keep publishing great poets like Aimee Nezhukumatahil, Ellen Dore Watson, Kathleen Jesme, and others. Because I believe in poetry. And you should, too. What’s in it for me? you might ask. Well, other than the satisfaction of supporting an independent literary press, how about the opportunity to tell me what to say or see your name in print? For a donation $5, I will dedicate a poem to you! A poem which will be posted to the Tupelo Press website and which you can see for days and months to come! Just imagine! For a $10 donation, you can give me a theme to write my daily poem about. AND I will dedicate it to you. For any donation of $20 or more, I will dedicate a poem to you AND write it on the theme of your choosing, AND plaster your name and your awesome contribution all over the book of faces and Twitter. as moths circle a bare bulb. So, the dog. Have you had your suspicions? of dark lager—five of them could kill you with one swift strike. Would she save me from a burning building? about to kidnap/maim/violate her hapless human? a mother, if the universe hadn’t had other plans for her. and superheroes: Never reveal your true identity. Filed under poetry, scenes from a suburban life |	Enter your password to view comments.